31st August 1957. 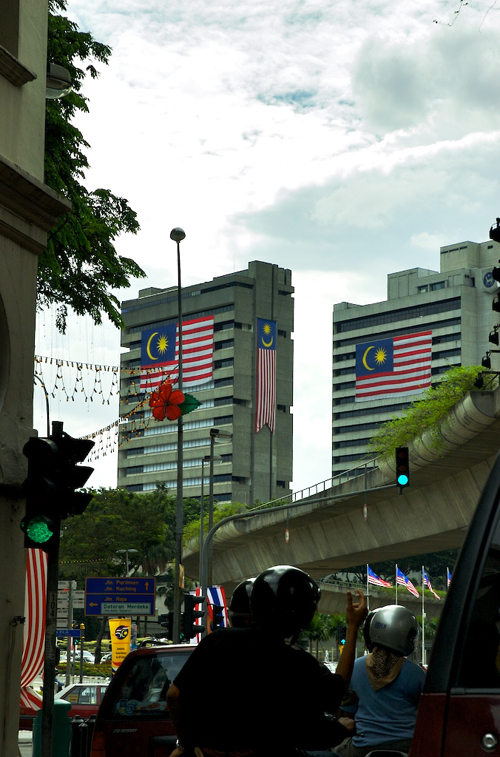 50 years ago, Malaysia became an independent country. Free from the hundreds of years of European colonialists and a brief Japanese occupation. Today, we raise our national pride as well as our flags. Look at our city. Flags everywhere. EVERYWHERE! See you at theme day tomorrow. A few months ago, I took up the offer of teaching at GIIS (Global Indian International School.) I take on Years 5 and 6. Forty-plus 10 year-olds shouting and demanding 'Sir's' attention. I'm still sane and these kids are wonderful. As an extracurricular activity, a group of 12 students were brought together to create a piece of community theatre. Allow me to backtrack: The students of GIIS are mostly upper-middle class and most have never experienced the world that surrounds their white picket fences. This group came together with a purpose of sharing their stories with many children who are less fortunate. 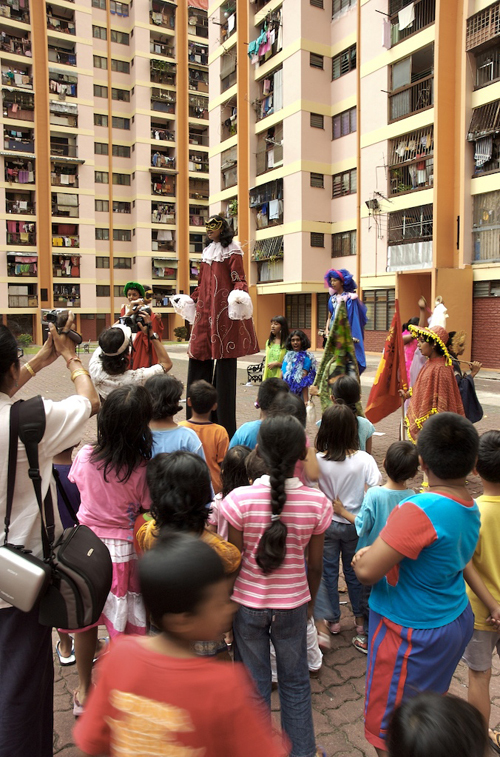 Though the months, they learned to develop stories, walk on stilts, make costumes and dream a million dreams. When they were ready, they taken out to perform in squater-areas and high-density government flats. The picture you see above is from the latter. Each time, they brought smiles and joy to the children who followed their every move and in turn, discovered new smiles of their own. To quote one of them, Hari Haran, "I feel that Global Harmony is like a leaf. You know, you can see all the lines. They are all connected to one another. That's like us. We should all be connected through harmony." I am proud to say that Hari is in my class and have known him since he was a baby. To see him grow and to have heard him say this, I know there will always be better days. Yesterday, I finally went to see my acupunturist, Dr.Liew. I've been meaning to see him for months because of my back problem. So, Way Cheng and me drove to him for one of our sessions. Needles, cupping (as you can see) and a painful half hour of acupressure. Feeling so much better now. Will feel even better after a couple more sessions. Next one next Wednesday. Today is my birthday. 33. A master number. And being the 11th, another master number, it's doubly good. The next one will only come when I'm 44. Not that I'm big on numerology, of course. However, I'm feeling positive about this next year of mine. Thanks for the picture taking, Way Cheng. Have a great weekend everyone. Wau is a uniquely designed Malaysian kite. It is called 'Wau' because the shape of its wing is similar to an Arabic letter (pronounced "wow"). It is a marvelous tradition inherent to the culture of the people, especially in the Eastern States of the Malayan Peninsula. 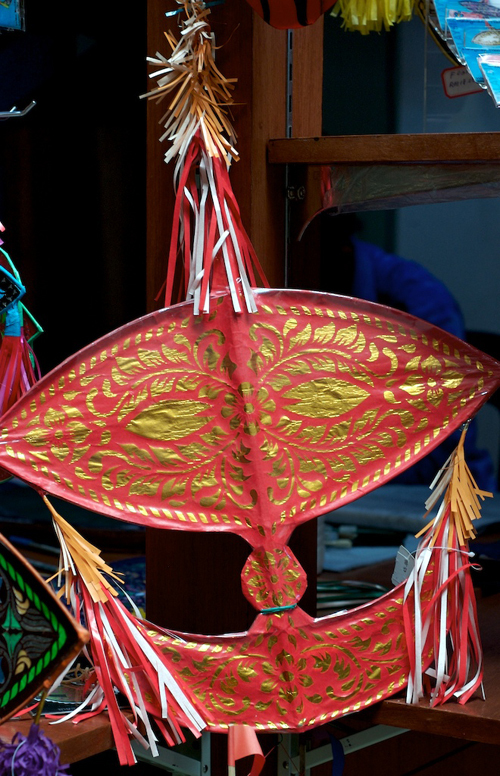 Today, the kite is still widely found in Kelantan and Terengganu, especially during harvest time. This Wau that you see is for decorative purposes. One for tourists to buy and proudly display at home. Am I back? Is KLDP returning? Perhaps. Not daily but I do have a couple of shots that MUST and NEED to be shared. EXTRA! EXTRA!! NYCDP meets KLDP in KL! Here's a shot of Ming, whose identity will remain secret. Thanks again Ming. Its always a joy to meet a fellow DP member. Hope you're having a great weekend in my city. Till we meet again. Welcome August! 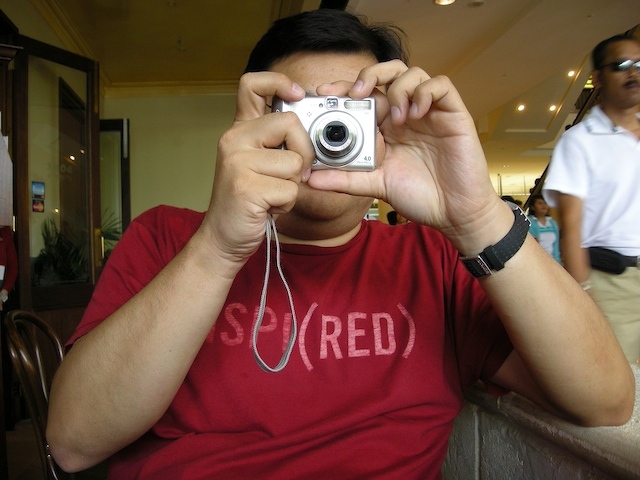 This is a great month for Malaysians, but we'll get to that once I've described the photo I've chosen for our theme day. Malaysians love to eat. And everyone has their favourite for breakfast. One of mine is Roti Canai. It's a kind of pancake. In this photo, you see the guy 'whipping' the pancake. Once it's stretched out, he lays in on the surface and folds it which he then places on a flat and big flat pan to cook. 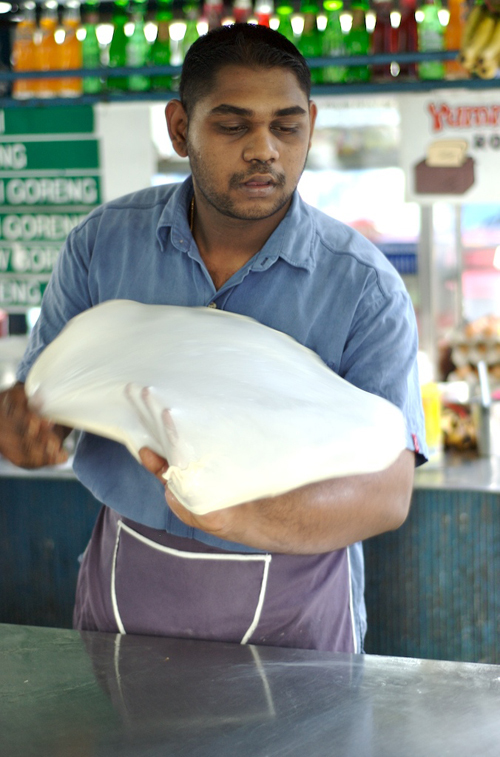 Roti Canai is served with dhaal or curry. When I was a kid, I had it with a healthy sprinkling of sugar. Woke up late today so only coffee for breakfast. As I mentioned, August is a month of great celebration for us Malaysians. This is when Independence Day celebrations kick into high-gear. There'll be a fireworks competition between 4 countries, a slew of exhibitions, a few parades, all leading towards D-Day at the end of August. Hari Merdeka, that's what we call it. Maybe I'll be able to photograph something that I'll be able to post for next month's theme. Until then, do enjoy your breakfast and perhaps pick something from our international buffet. You have a choice of 100 different cities.